Research suggest that if you add salmon fish into your diet than you can increase the chances of maintaining a healthy brain well into your old age. Deep-water fish, such as salmon, are rich in omega-3 essential fatty acids, which are essential for brain function. Omega-3s also contain anti-inflammatory substances. It is nutritionally dense and something of a super food to maintain health brain and keeps your mood better. Let’s see amazing benefits of salmon fish for brain, mood enhancement and health. Salmon is always listed as a great source of calcium, but it is actually the bones in salmon which have all the calcium. So when using tinned salmon, mash up and eat the small bones. Of all the different types of fish, salmon has received the most praise for being a nutritional marvel. It’s credited with everything from extending a person’s lifespan to preventing heart attacks and cancer. Salmon are described as anadromous; born in fresh water before spending a large portion of their lives navigating the open sea only to swim back to their birthplace in order to spawn. This extraordinary homing mechanism is said to be attributed to their olfactory memory (memory of smell). A reason why these intelligent, intuitive fish are considered a ‘brain food’. The vitamin A, vitamin D and selenium in salmon protect the nervous system from age-related damage and can even act as an antidepressant. Studies suggest that long-term omega-3 supplementation can help prevent and treat Alzheimer’s disease and Parkinson’s symptoms. A person with higher levels of omega-3 fatty acids in their blood experienced fewer hip fractures. Inflammation contributes to bone resorption, a process in which bone tissue is broken down. Since omega-3-rich salmon is a natural anti-inflammatory food, eating this delicious fish on a regular basis is a great way to keep your bones strong. Salmon benefits the skin owing to the presence of fatty acids and vitamin A. These healthy fats improve the skin quality and health. 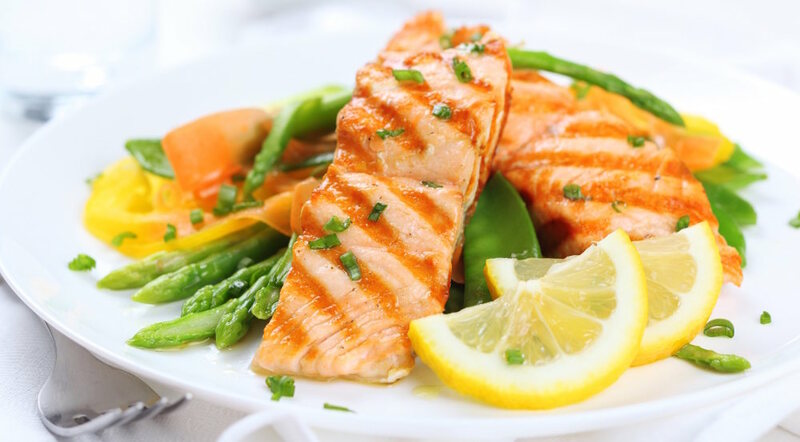 Omega-3 fatty acids work in collaboration with the carotenoid antioxidants of astaxanthin in salmon to tremendously reduce free radical damage that is responsible for aging. If you think you’ve seen enough of the health benefits of the Omega-3 in salmon, look again—the list goes on. Omega-3 fatty acids, together with the amino acids in salmon, work to prevent eye dryness (as in cases of chronic dry eye), eye fatigue, mascular degeneration, and loss of vision. Protect your peepers and keep your vision sharp for longer by making salmon part of your regular diet.